When I need a quick fix of wilderness I take Tram 21 to the wildest place in Rotterdam – De Esch nature park. It’s a tiny nature reserve in the big city, that owes its existence to its dirty past as a dumpsite for sludge from the Rotterdam harbor. The soil here was deemed too contaminated for human residence, so the site was left to its own destiny and a wonderful nature area has emerged. The park is a hub of biodiversity rich with birds, plants and insects. Amazingly, a quarter of the species breeding in The Netherlands have been spotted here, in the heart of Rotterdam! If you’re lucky, you might even spot kingfishers diving in the ponds and streams. My favorite part of De Esch is the sheep herd that grazes on the grassy patches. 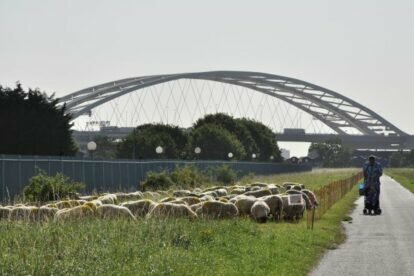 Sheep against the background of the Brienoord bridge – to me its as Rotterdam as it gets.